NEW YORK, August 16, 2012 – Bank stability remains a pressing concern for the world’s corporations and investors. 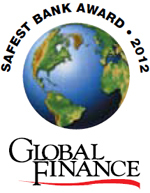 It is within this context that Global Finance announces it’s 21st Annual Ranking of the World’s 50 Safest Banks . Europe’s sovereign debt crisis and slowing growth are having a significant impact on bank ratings. Global instability is also in the spotlight. Companies are watching closely to see how these events are affecting their counterparties. Canadian banks are the best performing in North America with seven banks in the top 50 compared to five from United States. Banks from Singapore are the strongest in Asia and from Chile in Latin America. Credit ratings and rankings of most European banks have suffered except for those at the very top of the list which have explicit guarantees from AAA rated governments. With the Top 10 banks unchanged as of an April 2012 update to last year’s rankings, the Global Finance list shows that most of the top echelon of banks are truly worthy of the distinction of being named World’s Safest Bank . Winners were selected through an evaluation of long-term credit ratings—from Moody’s, Standard & Poor’s and Fitch—and total assets of the 500 largest banks worldwide. The full results of this exclusive survey will be published in the October issue of Global Finance . The banks ranked 1-10 will be presented awards at a special ceremony to be held during the Annual Meetings of the IMF and World Bank in Tokyo in October.